Have you ever looked at a swimming pool all shimmering blue? From say, the 10th floor of a building? I happened to have such a view of an empty pool yesterday. Ripple after ripple plaiting into one another creating honeycomb-like shapes. Sunlight beating down on creating shiny outlines to each random shape. Sometime I wonder whether all this is a lesson on its own. Wonder whether we can learn from just shutting our traps and watching. Breathing in and breathing out. And Whether we are all just ripples in the pool of time. Imagining, thinking that we are leaving a mark, but creating only a ripple. But maybe that ripple is what is all important. Why would it not be. And that, each one winds into another, shapes another and creates something new. That which forms solely and that which is created with the help of another ......... And shape after shape united in one limpid pool. Limpid: to be free from obscurity. When and how do we lose the limpidness? And when does obscurity come in? How and when do things become murky? And do we consciously allow that? If so why? Have you ever felt something calling out to you, a feeble voice at first and then it gets louder? And you really dont understand where it is coming from what you are supposed to do. So many times I feel like something from somewhere is calling out to me and it irritates me not to know what it is about.. The search of the unknown is one of the most suffering ones. And this is when I ask the cosmos that has so often given me what I want. If the cosmos is reading my blog.. here is to you. Time to help me. To know the answer of an unknown question. Even as I go through the passage for seeming errors and polishing up some lines, I am struck by the amazing weirdness of this passage. And realize that with all the psychology that I have studied, I am not quite a "normal" person really. And as of now, though I am a student of psychology, I dont seem to be friends with it. It has lead me to ask several questions. None of which have any answers yet. Or rather I havent been looking at the right places. But then who or what decides normalcy? How does anyone define or have the capacity to define normalcy? We are all happily weird in our own ways and probably revel in the knowledge. Or more commonly, in the lack of it. I am in this state of mind that cannot be really defined. Even as my mind makes a futile attempt to leaf through word after word. What would it be like to just rise up and dissolve in to the blue sky? By the way the sky over Orlando is a brilliant shade of blue. Enjoy the time there, it's a great place, and if you have time in your hands, think of takin a cruise to Hawaii, one of the greatest destinations I've ever been (but with a wrong group anyway, you get my point). wat does 1 want ? here is 1 gal who lives 1 life many ppl would envy and yet still doesnt know wat she wants! 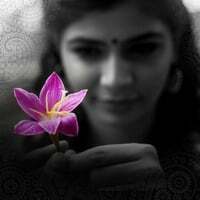 interesting chinmayi! i luv this post as it shows the other side of the gal whom i think knows exactly wat she wants and be able to find time and energy to do it! I wish i know wat i want out of my life, as well!! hope we find out !! Phew! quite a load there, Chinamayi. Your thought about all people being mere ripples in the pool of time struck a chord in me. About all the questions and unknown answers and our endless quest .. there is this hindu philosphy that beleives that "self" knows it all. It is the noise created by the distractions outside (maya) hinders us from hearing to the answers from within the self. There is this old sanskrit saying " All this struggle to learn, while all we have to do is remember". Hope you had a great show and a good stay in the US. polish and imaginative use of words to visualize the answer to the unknown questions..
Why the hell do u have to put scenes like these?? ?U can just be a normal person..You are just normal perosn..Nothing more than that..
Good Post. Keep it flowing. It seems the "Self" in all prods us to maintain a state of aloofness; yet we remain networked to reach a state of interdependability. I happened to read your comments regarding the limitations of Psychology. Similar line of thought has been put together as a book by John Horgan titled " The undiscovered mind : How the human brain defies replication, medication and explanation". You might as well enjoy the book as it tries to have a critical view of feudal theory that forms one of the basis of psychiatry. "The search of the unknown is one of the most suffering ones." - So you have experienced it too. Your post seemed like my own diary. maybe we have come a long way than those who dont have any search at all. I have always had this wierd (not exactly wierd) feeling that Iam unique and am not a normal person. Also, at most times when Iam anxious or restless, I hear a lot of voices. Until recently, I realised that reality is the key to every unknown questions. I tell myself that keeping it real is the only antidote for tortured souls. The Purpose, it's elusive, i tell you..
And for someone whom i figured to be close to hers, the post amuses me. You are doing what you have always wanted to do.. Every day. Call that a gift perhaps? Here's a quote I found a few days back that your blog just reminded me of..
"Everything has been figured out, except how to live" - Jean-Paul Sartre. "Obscurity and otherwise" a good post.Let me tell you just one thing believe me chinmayi,there are infinite things in the world that tampers ones mind for a concrete explanation.But the one only "HE",Lord,is the one who can answer to all these queries.HE is the one who relieves us of all these trials n triumph.Just live the life.Take life as it just comes to you.You are one "GEM" created by "HIM".Let your taughts free.Be happy.Good luck to you!!!! Great post. Good food for thoughts. I wonder if the emptiness of pond made you to think so much. Shaken by these alarming thoughts, I find strength and a courage I didn’t know I had: they help me to venture into an unknown part of my soul. I let myself be swept along by the current, and finally anchor my boat at the island I was being carried towards. I spends days and nights describing what I see, wondering why I’m doing this, telling myself that it’s really not worth the pain and effort,that I don’t need to prove anything to anyone, that I’ve got what I wanted and far more that I ever dreaming of having”. Enjoy your solitude. May God bless you always girl. I am sure that this post would trigger, atleast a handful of individuals, to search for the truth(மெய்யுண்மை). P.S. I wonder, how you get time to think these stuff admist your busy schedule. when is it going to release ?? but i saw ur name in the track list it seems u sang 2 songs rite ?? I know there are thousands of people reading your blog everyday. So thought of posting a request here.A 3 and half year old Mohammed Shaur Abbas a resident of Chennai, is suffering from Blood Cancer and is in need to 20 lakh rupees for his surgery.A small monetary help from us wud definitely save a life. Those who wish to contribute, please visit the site www.helpthekid.org. this post is very boring. omg!! i see a big halo behing your head now!!! I Really admire your Vocabulary !! Trust me if you start writing short stories ( like the works of Sudha Murthy )...you gonna achieve more n more heights in life !! Your blogs are really good ones, i enjoy reading them.